This article is about the event in the life of the Holy Family. For for the liturgical feast, see Candlemas. Presentation at the Temple by Ambrogio Lorenzetti, 1342 (Galleria degli Uffizi, Florence). The Presentation of Jesus at (or in) the Temple is an early episode in the life of Jesus, describing his presentation at the Temple in Jerusalem in order to officially induct him into Judaism, that is celebrated by many Christian Churches on the holiday of Candlemas. It is described in the Gospel of Luke of the New Testament in the Christian Bible. Within the account, "Luke's narration of the Presentation in the Temple combines the purification rite with the Jewish ceremony of the redemption of the firstborn (Luke 2:23–24)." In the Eastern Orthodox Church, the Presentation of Jesus at the temple is celebrated as one of the twelve Great Feasts, and is sometimes called Hypapante (Ὑπαπαντή, = "Meeting" in Greek). In Western Christianity, the additional name for the Service the day, Candlemas, is added. This Feast-day is also known as the Feast of the Purification of the Virgin or the Meeting of the Lord. In some liturgical churches, Vespers (or Compline) on the Feast of the Presentation marks the end of the Epiphany season. In the Church of England, the Mother Church of the Anglican Communion, the Presentation of Christ in the Temple is a Principal Feast celebrated either on 2 February or on the Sunday between 28 January and 3 February. In the Catholic Church, especially since the time of Pope Gelasius I (492-496) who in the fifth century contributed to its expansion, the Presentation is celebrated on 2 February and is the fourth Joyful Mystery of the Rosary. In the Latin Rite of the Catholic Church, the Anglican Communion and the Lutheran Church, the episode was also reflected in the once-prevalent custom of churching new mothers forty days after the birth of a child. Meeting of the Lord, Russian Orthodox icon, 15th century. The event is described in the Gospel of Luke (Luke 2:22–40). According to the gospel, Mary and Joseph took the Infant Jesus to the Temple in Jerusalem forty days (inclusive) after his birth to complete Mary's ritual purification after childbirth, and to perform the redemption of the firstborn son, in obedience to the Torah (Leviticus 12, Exodus 13:12–15, etc.). Luke explicitly says that Joseph and Mary take the option provided for poor people (those who could not afford a lamb; Leviticus 12:8), sacrificing "a pair of turtledoves, or two young pigeons." Leviticus 12:1–4 indicates that this event should take place forty days after birth for a male child, hence the Presentation is celebrated forty days after Christmas. “Lord, now let your servant depart in peace, according to your word; for my eyes have seen your salvation which you have prepared in the presence of all peoples, a light for revelation to the Gentiles, and for glory to your people Israel.” (Luke 2:29–32). Simeon then prophesied to Mary: "Behold, this child is set for the fall and rising of many in Israel, and for a sign that is spoken against (and a sword will pierce through your own soul also), that thoughts out of many hearts may be revealed. (Luke 2:34–35). The elderly prophetess Anna was also in the Temple, and offered prayers and praise to God for Jesus, and spoke to everyone there of His importance to redemption in Jerusalem (Luke 2:36–38). The event forms a usual component of extensive cycles of the Life of Christ and also of the Life of the Virgin. Often either the Presentation of Jesus or the visually similar Circumcision of Jesus was shown, but by the late Middle Ages the two were sometimes combined. 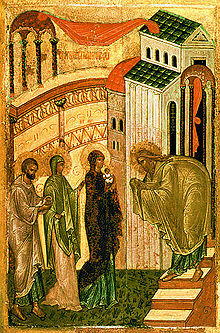 Early images concentrated on the moment of meeting with Simeon, typically shown at the entrance to the Temple, and this is continued in Byzantine art and Eastern Orthodox icons to the present day. In the West, beginning in the 8th or 9th century, a different depiction at an altar emerged, where Simeon eventually by the Late Middle Ages came to be shown wearing the elaborate vestments attributed to the Jewish High Priest, and conducting a liturgical ceremony surrounded by the family and Anna. In the West, Simeon is more often already holding the infant, or the moment of handover is shown; in Eastern images the Virgin is more likely still to hold Jesus. Many motets and anthems have been composed to celebrate this feast and are performed as part of the liturgy, among them an anthem by 16th century German composer Johannes Eccard (1553–1611), Maria wallt zum Heiligtum, often translated in English as "When Mary to the Temple went". The Lutheran church of the Baroque observed the feast as "Mariae Reinigung" (Purification of Mary). Johann Sebastian Bach composed several cantatas to be performed in the church service of the day, related to Simeon's canticle Nunc dimittis as part of the prescribed readings. In addition to being known as the Feast of the Presentation of Jesus at the Temple, other traditional names include Candlemas, the Feast of the Purification of the Virgin, and the Meeting of the Lord. The date of Candlemas is established by the date set for the Nativity of Jesus, for it comes forty days afterwards. Under Mosaic law as found in the Torah, a mother who had given birth to a boy was considered unclean for seven days; moreover she was to remain for three and thirty days "in the blood of her purification." Candlemas therefore corresponds to the day on which Mary, according to Jewish law, should have attended a ceremony of ritual purification (Leviticus 12:2–8). The Gospel of Luke 2:22–39 relates that Mary was purified according to the religious law, followed by Jesus' presentation in the Jerusalem temple, and this explains the formal names given to the festival, as well as its falling 40 days after the Nativity. In the Roman Catholic Church, it is known as the "Presentation of the Lord" in the liturgical books first issued by Paul VI, and as the "Purification of the Blessed Virgin Mary" in earlier editions. In the Eastern Orthodox Church and Greek Catholic Churches (Eastern Catholic Churches which use the Byzantine rite), it is known as the "Feast of the Presentation of our Lord, God, and Savior Jesus Christ in the Temple" or as "The Meeting of Our Lord, God and Saviour Jesus Christ". In the churches of the Anglican Communion, it is known by various names, including: The Presentation of Our Lord Jesus Christ in The Temple (Candlemas) (Episcopal Church), The Presentation of Christ in the Temple, and The Purification of the Blessed Virgin Mary (Anglican Church of Canada), The Presentation of Christ in the Temple (Candlemas) (Church of England), and The Presentation of Christ in the Temple (Anglican Church of Australia). It is known as the Presentation of Our Lord in the Evangelical Lutheran Church in America. The Lutheran Church–Missouri Synod observes 2 February as The Purification of Mary and the Presentation of Our Lord. In some Protestant churches, the feast is known as the Naming of Jesus (though historically he would have been named on the eighth day after the Nativity, when he was circumcised). Traditionally, Candlemas had been the last feast day in the Christian year that was dated by reference to Christmas. It is another "epiphany" type feast as Jesus is revealed as the messiah by the canticle of Simeon and the prophetess Anna. It also fits into this theme, as the earliest manifestation of Jesus inside the house of his heavenly Father. Subsequent moveable feasts are calculated with reference to Easter. Candlemas occurs 40 days after Christmas. Traditionally, the Western term "Candlemas" (or Candle Mass) referred to the practice whereby a priest on 2 February blessed beeswax candles for use throughout the year, some of which were distributed to the faithful for use in the home. In Poland the feast is called Święto Matki Bożej Gromnicznej (Feast of Our Lady of Thunder candles). This name refers to the candles that are blessed on this day, called gromnice, since these candles are lit during (thunder) storms and placed in windows to ward off storms. 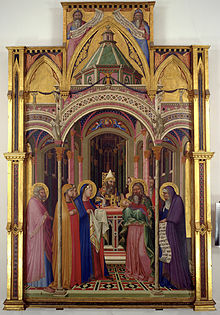 This feast has been referred to as the Feast of Presentation of the Lord within the Roman Catholic Church since the liturgical revisions of the Second Vatican Council, with references to candles and the purification of Mary de-emphasised in favor of the Prophecy of Simeon the Righteous. Pope John Paul II connected the feast day with the renewal of religious vows. In the Roman Catholic Church, the Presentation of Jesus in the Temple is the fourth Joyful Mystery of the Rosary. In the Liturgy of the Hours, the Marian antiphon Alma Redemptoris Mater is used from Advent through February 2, after which Ave Regina Caelorum is used through Good Friday. In the Byzantine tradition practiced by the Eastern Orthodox, the Meeting of the Lord is unique among the Great Feasts in that it combines elements of both a Great Feast of the Lord and a Great Feast of the Theotokos (Mother of God). It has a forefeast of one day, and an afterfeast of seven days. However, if the feast falls during Cheesefare Week or Great Lent, the afterfeast is either shortened or eliminated altogether. The holiday is celebrated with an all-night vigil on the eve of the feast, and a celebration of the Divine Liturgy the next morning, at which beeswax candles are blessed. This blessing traditionally takes place after the Little Hours and before the beginning of the Divine Liturgy (though in some places it is done after). The priest reads four prayers, and then a fifth one during which all present bow their heads before God. He then censes the candles and blesses them with holy water. The candles are then distributed to the people and the Liturgy begins. It is because of the biblical events recounted in the second chapter of Luke that the Churching of Women came to be practiced in both Eastern and Western Christianity. The usage has mostly died out in the West, except among Western Rite Orthodoxy, very occasionally still among Anglicans, and Traditionalist Catholics, but the ritual is still practiced in the Orthodox Church. In addition, babies, both boys and girls are taken to the Church on the fortieth day after their birth in remembrance of the Theotokos and Joseph taking the infant Jesus to the Temple. Some Christians observe the practice of leaving Christmas decorations up until Candlemas. Meeting of the Lord, Orthodox icon from Belarus (1731). In the Eastern and Western liturgical calendars the Presentation of the Lord falls on 2 February, forty days (inclusive) after Christmas. In the Church of England it may be celebrated on this day, or on the Sunday between 28 January and 3 February. This feast never falls in Lent; the earliest that Ash Wednesday can fall is 4 February, for the case of Easter on 22 March in a non-leap year. However, in the Tridentine rite, it can fall in the pre-Lenten season if Easter is early enough, and "Alleluia" has to be omitted from this feast's liturgy when that happens. In Swedish and Finnish Lutheran Churches, Candlemas is (since 1774) always celebrated on a Sunday, at earliest on 2 February and at latest on 8 February, except if this Sunday happens to be the last Sunday before Lent, i.e. Shrove Sunday or Quinquagesima (Swedish: Fastlagssöndagen, Finnish: Laskiaissunnuntai), in which case Candlemas is celebrated one week earlier. In the Armenian Apostolic Church, the Feast, called "The Coming of the Son of God into the Temple" (Tiarn'ndaraj, from Tyarn-, "the Lord", and -undarach "going forward"), is celebrated on 14 February. The Armenians do not celebrate the Nativity on 25 December, but on 6 January, and thus their date of the feast is 40 days after that: 14 February. The night before the feast, Armenians traditionally light candles during an evening church service, carrying the flame out into the darkness (symbolically bringing light into the void) and either take it home to light lamps or light a bonfire in the church courtyard. The Feast of the Presentation is among the most ancient feasts of the Church. Celebration of the feast dates from the fourth century in Jerusalem. There are sermons on the Feast by the bishops Methodius of Patara († 312), Cyril of Jerusalem († 360), Gregory the Theologian († 389), Amphilochius of Iconium († 394), Gregory of Nyssa († 400), and John Chrysostom († 407). XXVI. "The fortieth day after the Epiphany is undoubtedly celebrated here with the very highest honor, for on that day there is a procession, in which all take part, in the Anastasis, and all things are done in their order with the greatest joy, just as at Easter. All the priests, and after them the bishop, preach, always taking for their subject that part of the Gospel where Joseph and Mary brought the Lord into the Temple on the fortieth day, and Symeon and Anna the prophetess, the daughter of Phanuel, saw him, treating of the words which they spake when they saw the Lord, and of that offering which his parents made. And when everything that is customary has been done in order, the sacrament is celebrated, and the dismissal takes place." An Armenian miniature illustrating the subject (Mugni Gospels, ca. 1060). About 450 AD in Jerusalem, people began the custom of holding lighted candles during the Divine Liturgy of this feast day. Originally, the feast was a minor celebration. But then in 541, a terrible plague broke out in Constantinople, killing thousands. The Emperor Justinian I, in consultation with the Patriarch of Constantinople, ordered a period of fasting and prayer throughout the entire Empire. And, on the Feast of the Meeting of the Lord, arranged great processions throughout the towns and villages and a solemn prayer service (Litia) to ask for deliverance from evils, and the plague ceased. In thanksgiving, in 542 the feast was elevated to a more solemn celebration and established throughout the Eastern Empire by the Emperor. In Rome, the feast appears in the Gelasian Sacramentary, a manuscript collection of the seventh and eighth centuries associated with Pope Gelasius I. There it carries for the first time the new title of the feast of Purification of the Blessed Virgin Mary. Late in time though it may be, Candlemas is still the most ancient of all the festivals in honor of the Virgin Mary. The date of the feast in Rome was 2 February because the Roman date for Christ's nativity had been 25 December since at least the early fourth century. Though modern laymen picture Candlemas as an important feast throughout the Middle Ages in Europe, in fact it spread slowly in the West; it is not found in the Lectionary of Silos (650) nor in the Calendar (731–741) of Sainte-Geneviève of Paris. The tenth-century Benedictional of St. Æthelwold, bishop of Winchester, has a formula used for blessing the candles. Candlemas did become important enough to find its way into the secular calendar. It was the traditional day to remove the cattle from the hay meadows, and from the field that was to be ploughed and sown that spring. References to it are common in later medieval and early Modern literature; Shakespeare's Twelfth Night is recorded as having its first performance on Candlemas Day 1602. It remains one of the Scottish quarter days, at which debts are paid and law courts are in session. The Feast of the Presentation depends on the date for Christmas: As per the passage from the Gospel of Luke (Luke 2:22–40) describing the event in the life of Jesus, the celebration of the Presentation of the Lord follows 40 days after. The blessing of candles on this day recalls Simeon's reference to the infant Jesus as the "light for revelation to the Gentiles" (Luke 2:32). Modern Pagans believe that Candlemas is a Christianization of the Gaelic festival of Imbolc, which was celebrated in pre-Christian Europe (and especially the Celtic Nations) at about the same time of year. Imbolc is called "St. Brigid's Day" or "Brigid" in Ireland. Both the goddess Brigid and the Christian Saint Brigid—who was the Abbess of Kildare—are associated with sacred flames, holy wells and springs, healing, and smithcraft. Brigid is a virgin, yet also the patron of midwives. However, a connection with Roman (rather than Celtic or Germanic) polytheism is more plausible, since the feast was celebrated before any serious attempt to expand Christianity into non-Roman countries. In Irish homes, there were many rituals revolving around welcoming Brigid into the home. Some of Brigid's rituals and legends later became attached to Saint Brigid, who was seen by Celtic Christians as the midwife of Christ and "Mary of the Gael". In Ireland and Scotland she is the "foster mother of Jesus." The exact date of the Imbolc festival may have varied from place to place based on local tradition and regional climate. Imbolc is celebrated by modern Pagans on the eve of 2 February, at the astronomical midpoint, or on the full moon closest to the first spring thaw. Frederick Holweck, writing in the Catholic Encyclopædia says definite in its rejection of this argument: "The feast was certainly not introduced by Pope Gelasius to suppress the excesses of the Lupercalia," (referencing J.P. Migne, Missale Gothicum, 691) The 1911 Encyclopædia Britannica agrees: the association with Gelasius "has led some to suppose that it was ordained by Pope Gelasius I in 492 as a counter-attraction to the pagan Lupercalia; but for this there is no warrant." Since the two festivals are both concerned with the ritual purification of women, not all historians are convinced that the connection is purely coincidental. Gelasius certainly did write a treatise against Lupercalia, and this still exists. Why do we in this feast carry candles? Because the Gentiles dedicated the month of February to the infernal gods, and as at the beginning of it Pluto stole Proserpine, and her mother Ceres sought her in the night with lighted candles, so they, at the beginning of the month, walked about the city with lighted candles. Because the holy fathers could not extirpate the custom, they ordained that Christians should carry about candles in honor of the Blessed Virgin; and thus what was done before in the honor of Ceres is now done in honor of the Blessed Virgin. There is no contemporary evidence to support the popular notions that Gelasius abolished the Lupercalia, or that he, or any other prelate, replaced it with the Feast of the Purification of the Blessed Virgin Mary. In Armenia, celebrations at the Presentation have been influenced by pre-Christian customs, such as: the spreading of ashes by farmers in their fields each year to ensure a better harvest, keeping ashes on the roof of a house to keep evil spirits away, and the belief that newlywed women needed to jump over fire to purify themselves before getting pregnant. Young men will also leap over a bonfire. The tradition of lighting a candle in each window is not the origin of the name "Candlemas", which instead refers to a blessing of candles. On the day following Candlemas, the feast of St. Blaise is celebrated. It is connected to the rite of Blessing of the Throats – which is, for to be available to reach more people, also often transferred to Candlemas day. By coincidence, the rite includes crossed candles. Wherewith ye dress'd the Christmas Hall"
—  Robert Herrick (1591–1674), "Ceremony upon Candlemas Eve"
As the poem by Robert Herrick records, the eve of Candlemas was the day on which Christmas decorations of greenery were removed from people's homes; for traces of berries, holly and so forth will bring death among the congregation before another year is out. In Scotland, until a change in the law in 1991 (see Scottish term days), and in much of northern England until the 18th century, Candlemas was one of the traditional quarter days when quarterly rents were due for payment, as well as the day or term for various other business transactions, including the hiring of servants. In the United Kingdom, good weather at Candlemas is taken to indicate severe winter weather later: "If Candlemas Day is clear and bright, / winter will have another bite. / If Candlemas Day brings cloud and rain, / winter is gone and will not come again." It is also alleged to be the date that bears emerge from hibernation to inspect the weather as well as wolves, who if they choose to return to their lairs on this day is interpreted as meaning severe weather will continue for another forty days at least. The same is true in Italy, where it is called Candelora. The Carmina Gadelica, a seminal collection of Scottish folklore, refers to a serpent coming out of the mound on Latha Fheill Bride, as the Scots call Candlemas. This rhyme is still used in the West Highlands and Hebrides. Moch maduinn Bhride, Thig an nimhir as an toll; Cha bhoin mise ris an nimhir, Cha bhoin an nimhir rium. Thig an nathair as an toll, la donn Bride Ged robh tri traighean dh' an t-sneachd air leachd an lair. In France and Belgium, Candlemas (French: La Chandeleur) is celebrated with crêpes. In Italy, traditionally, it (Italian: La Candelora) is considered the last cold day of winter. Tenerife (Spain), Is the day of the Virgin of Candelaria (Saint Patron of the Canary Islands). 2 February. In Southern and Central Mexico, and Guatemala City, Candlemas (Spanish: Día de La Candelaria) is celebrated with tamales. Tradition indicates that on 5 January, the night before Three Kings Day (the Epiphany), whoever gets one or more of the few plastic or metal dolls (originally coins) buried within the Rosca de Reyes must pay for the tamales and throw a party on Candlemas. In certain regions of Mexico, this is the day in which the baby Jesus of each household is taken up from the nativity scene and dressed up in various colorful, whimsical outfits. In Luxembourg, Liichtmëss sees children carrying lighted sticks visiting neighbors and singing a traditional song in exchange for sweets. Sailors are often reluctant to set sail on Candlemas Day, believing that any voyage begun then will end in disaster—given the frequency of severe storms in February, this is not entirely without sense. According to over eight centuries of tradition, the swaddling clothes that baby Jesus wore during the presentation at the Temple are kept in Dubrovnik Cathedral, Croatia. ^ Porter, J. R. (1 September 1998). The Illustrated Guide to the Bible. Oxford University Press. p. 157. ISBN 9780195214628. Retrieved 27 December 2016. The story of the Presentation of Jesus to God in the Temple concludes Luke's birth narrative (Luke 2.22–39). ^ Perlove, Shelley; Silver, Larry (2009). Rembrandt's Faith: Church and Temple in the Dutch Golden Age. Penn State Press. p. 191. ISBN 9780271048383. Chisholm, Hugh, ed. (1911). "Candlemas" . Encyclopædia Britannica. 5 (11th ed.). Cambridge University Press. p. 179. ^ Liturgy of the Hours, 2 February. ^ "The Calendar". Prayer Book Society of Canada. 16 October 2013. ^ Oja (2007). Aikakirja 2007 (PDF) (in Finnish). Helsinki: Almanach office of Helsinki University. pp. 175–76. ISBN 952-10-3221-9. Archived from the original (PDF) on 22 March 2011. ^ "Kynttilänpäivä on valoisa Kristus-juhla" (in Finnish). Finnish Evangelical Lutheran Church. Retrieved 18 February 2014. ^ De Simone et Anna quo die Dominico in templo occurrerunt ac de sancta Deipara, in Patrologiæ Græcæ vol. 18, pp. 347–81. Available here on Google Books. ^ Homilia de Occursu Domini in Patrologiæ Græcæ vol. 33, pp. 1183–204 available here on archive.org and here on Google Books in latin and greek. And here translated in french in St Cyrille de Jérusalem, Oeuvres complètes, trad. A. Faivre, 1844, vol. 2, pp. 447–62 on archive.org. As discuted in the introduction written by Faivre, and as reflected in the classification in "Opera S. Cyrillo Suppposita" in the Patrologiæ Græcæ its attribution to Cyril of Jerusalem is dubious, and has been attributed to Cyril of Alexandria by a few, but Faivre guesses that, considering the subjects discussed (Nestorianism, Monophysitism), it must have been someone from Jerusalem but in "the late fifth or early sixth century", living under the patriarchy of Sallustius (486–494) or Elias I(494–416). ^ De occursu Christi, et de Deipara, Anna et Simoeae, in Patrologiæ Græcæ vol. 39, pp. 43–60 available here in latin and greek on Google Books. ^ Milk Symbolism in the 'Bethu Brigte' by Thomas Torma University of Ulster Center for Irish and Celtic Studies, eDIL Project. Retrieved 7 February 2008. ^ On St. Brigit and Pagan Goddesses in the Kingdom of God by Sherry Rowley, Canadian Woman Studies Vol 17, No. 3 1998. Retrieved 7 February 2008. ^ Curiosities of Popular Customs and of rites, ceremonies, observances, and miscellaneous antiquities, by William Shepard Walsh, 1898. p. 168. Retrieved 7 February 2008. ^ Badham, Mike; Robinson, Robby; Badham, Michael (21 July 1999). "Sailors' Secrets". McGraw Hill Professional – via Google Books. ^ "Traditional and popular festivals in Luxembourg". Wikimedia Commons has media related to Presentation of Jesus Christ at the Temple. Poems by Robert Herrick including "Upon Candlemas Eve"